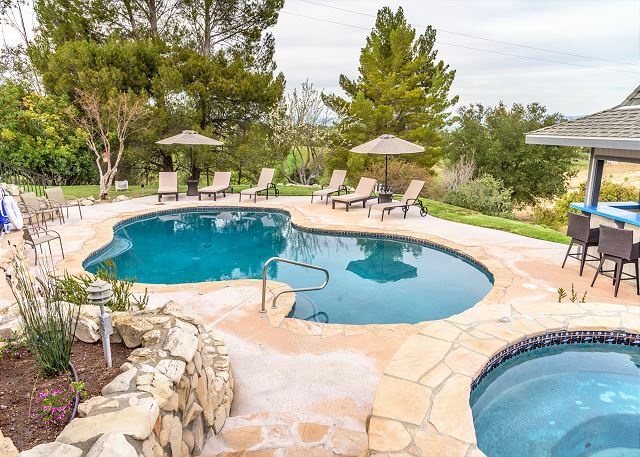 Deer Mountain--Privacy,Views, Pool & Spa, Minutes from Downtown Paso Robles! 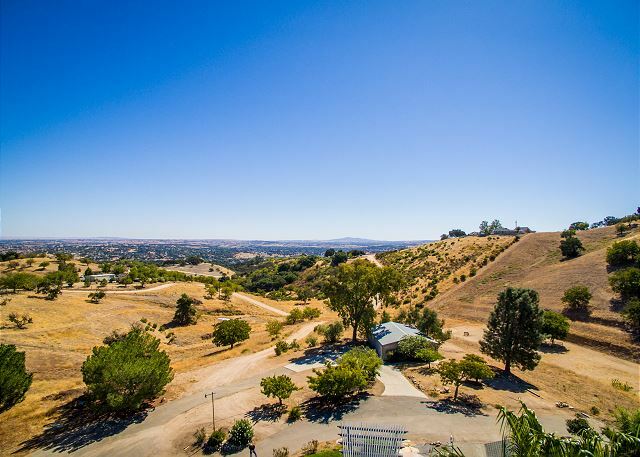 Hilltop views and quiet luxury await you at this stunning property located adjacent to Adelaide wine district, where some of Paso Robles’ most desirable wines are produced. 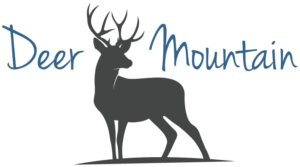 Deer Mountain Retreat is located on 20 acres and features 2 homes – with all single-level living spaces just steps across the circular drive from each other – accessed through a secure gated entrance. 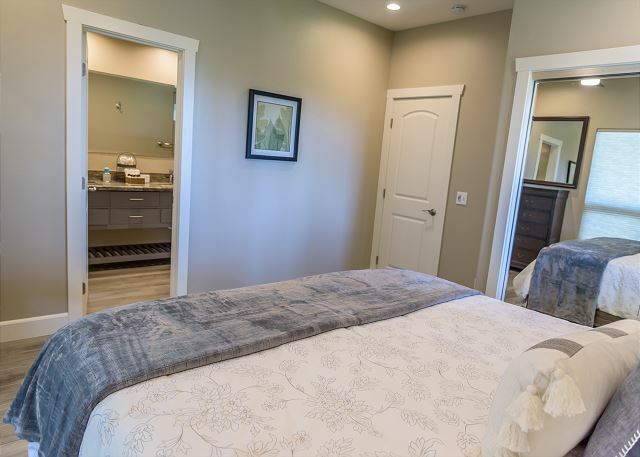 The two homes are beautifully built to include all en-suite baths with deluxe interior finishes throughout. 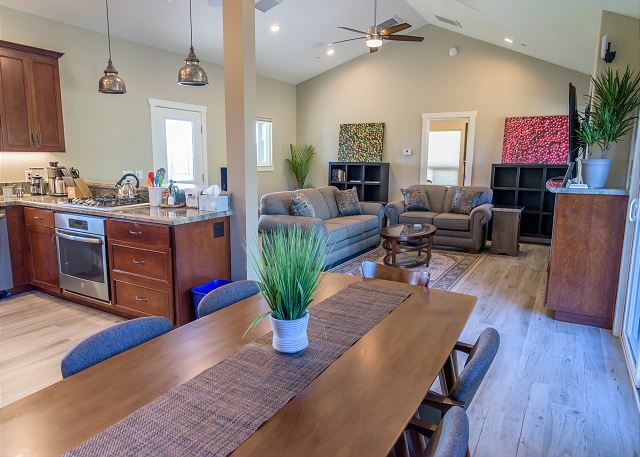 Panoramic views are seen through every window and sitting area – and yes there are many deer sightings on the beautiful hillside where a few of the old black walnut trees remain from earlier years of farming. The unique location provides secluded country relaxation only 2 miles from downtown Paso Robles. Guests are encouraged to enjoy the bounty of the fruit trees located on the property during their stay – the Valencia oranges are wonderful for morning juicing! The 3-bedroom main house includes: fully equipped kitchen with double oven, stainless steel appliances, gorgeous quartzite counter tops in kitchen and baths, en-suite baths with designer tile, a soaking tub, Keurig coffee makers in all bedrooms, Tuft & Needle mattresses, pool (heated mid-May to mid-October), spa, pool house, built-in BBQ under shady pergola, Sonos sound system, DirecTV Now, Internet, sleeper sofa, gas fireplace, game table, books, games…The 2-bedroom cottage house includes: fully equipped kitchen, stainless steel appliances, gorgeous quartzite countertops in kitchen and baths, en-suite baths with designer tile, 2 king Tuft & Needle mattresses, BBQ, Sonos sound system, DirecTV Now, Internet, sleeper sofa, books, games, gas fireplace… Paso Robles Vacation Rentals® is your local expert! Please contact us with questions about restaurants, wineries and fun things to do on the central coast! Great place to stay. This property is just as advertised . What a wonderful place to get away for a weekend! What an entrance - beautiful, gigantic gate leads you up an extended driveway up the hillside to your retreat! Two homes closer together than the pictures show, and amazing space enough for our full group. As this is a new property, only a few tweaks I would make: pool wasn't heated (pretty cold even in the 85 degree weather), add lights by the outdoor table, TV didn't work without a passcode (that wasn't listed anywhere), and gardeners were still there when we arrived. None of these resulted in less than 5 stars, but still, worth noting that could be improved for future guests. This home and surrounding area is beautiful and very well maintained. Centrally located for easy access to all the wineries we want to visit. We had a slight problem with water supply to the two bedroom home. The property manager and the owner responded immediately late at night and had the problem resolved within a few hours. Amazing Central Coast Wine Country Estate! for to base a cycling camp, all of our rides started from the front door. We dinned outdoors every evening watching the wildlife from poolside. We love Paso Robles and yes, we'll be back to Deer Mountain Retreat.